Hampton Bay LED outdoor wall lanterns use 70% less electricity than traditional incandescent fixtures, and there is no bulb to replace or recycle. The LED light source is the most reliable outdoor lighting available because it turns on instantly in any temperature, and lasts 50,000 hours without replacement. These fixtures are built with cast aluminum to look great for years to come. They are easy to install and are suitable for use in wet locations. This 6 inch wall lantern features a white finish and clear water glass with a simple, elegant design that compliments any exterior decor. This outdoor light fixture welcomes your guests in style and in safety, illuminates distinctive features of your home and/or garden, and creates an added ambiance for evening outdoors. This outdoor light fixture is fully weather resistant, making it suitable for any outdoor environment. This exterior light fixture is ideal for outdoor use, providing illumination to porches, entryways, and wherever additional lighting is needed. This fixture is ideal for outdoor use, providing additional illumination and ambiance to walkways, porches, gardens, and wherever additional lighting is needed. Includes all mounting hardware for quick and easy installation and requires one 60W equivalent A-Type E26light bulb (sold separately). 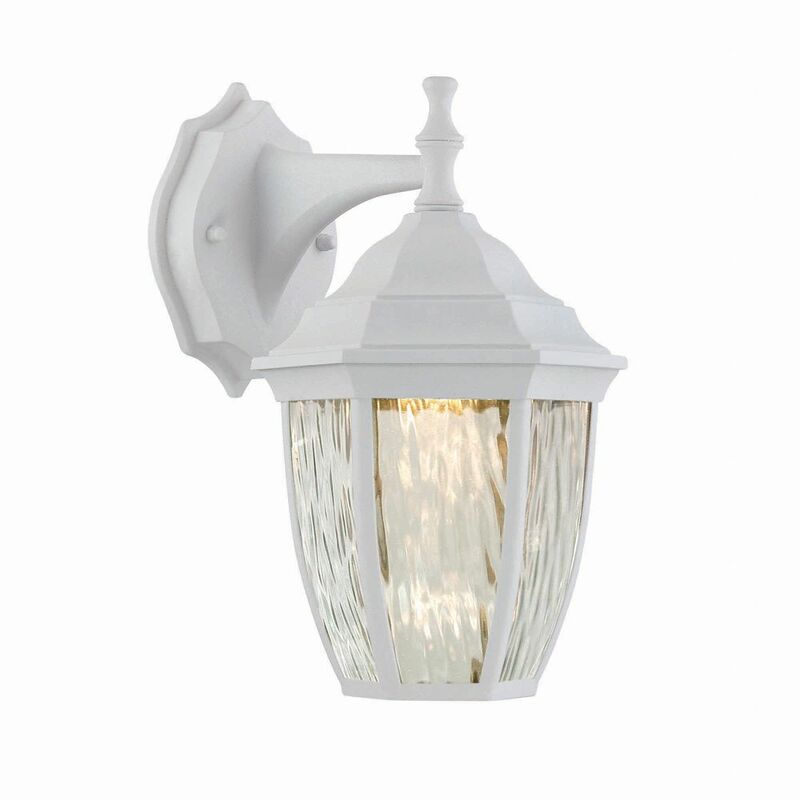 This Home Decorators Collection LED exterior wall lantern is uniquely designed with a traditional feel. Hand painted in oil rubbed bronze, it provides a clean, yet warm appeal. This uniquely designed fixture is the choice of discriminating yet value conscious homeowners who want to enrich their home. 1-Light White Integrated LED Outdoor Wall Lantern with Water Glass - ENERGY STAR® Hampton Bay LED outdoor wall lanterns use 70% less electricity than traditional incandescent fixtures, and there is no bulb to replace or recycle. The LED light source is the most reliable outdoor lighting available because it turns on instantly in any temperature, and lasts 50,000 hours without replacement. These fixtures are built with cast aluminum to look great for years to come. They are easy to install and are suitable for use in wet locations. This 6 inch wall lantern features a white finish and clear water glass with a simple, elegant design that compliments any exterior decor. 1-Light White Integrated LED Outdoor Wall Lantern with Water Glass - ENERGY STAR® is rated 1.0 out of 5 by 2. Rated 1 out of 5 by Dave from Disappointed I bought 3 and painted with hammered look silver to match the house. Looks great but only installed 3 weeks and one died. Can’t take back because of colour change. We will have to replace all. Rated 1 out of 5 by Sal49 from Not meant for Canadain Winters Bought three of these lights, only one starts up when the weather gets cold. Can this light be installed with a dimmer? No need to have it on a dimmer. You can dim it via the Bluetooth app. I am not an electrician but I am going to say yes you could only because you can dim it manually.